Counselors are able to offer new students to be a part of our shadowing program. 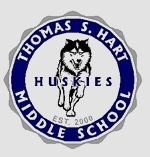 New students are paired up with current Hart students depending on grade level to help make the transition to a new school easier and more enjoyable. The Pleasanton school district offers the option of pre-enrolling new students online. Please click here for the online pre-enrollment site. Once you access the site, follow the prompts to create your account and securely save your information online. Pre-enrolling students online will save time when you show up at the office with enrollment documents.